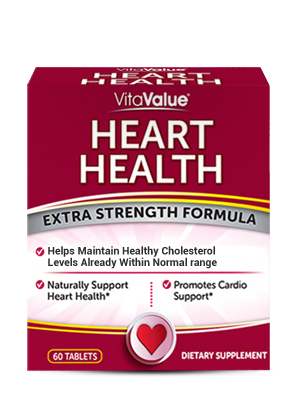 VitaValue® Heart Health is specially formulated with Phytosterols and B-vitamins including folic acid to help maintain healthy cholesterol levels already within normal range and a healthy heart. * Phytosterols are derived from plant-based foods. Many studies have found that plant sterols help maintain healthy cholesterol levels already within normal range and naturally support heart health. * Take care of the heart that takes care of you with VitaValue® Heart Health.